In Colorado, the word draught is always a hot topic. Conserving water is a huge part of life in Colorado. With the hot summer days, it can take a lot of water to keep your lawn lush and green. What’s the best way to have a beautiful yard and conserve water? Xeriscaping! 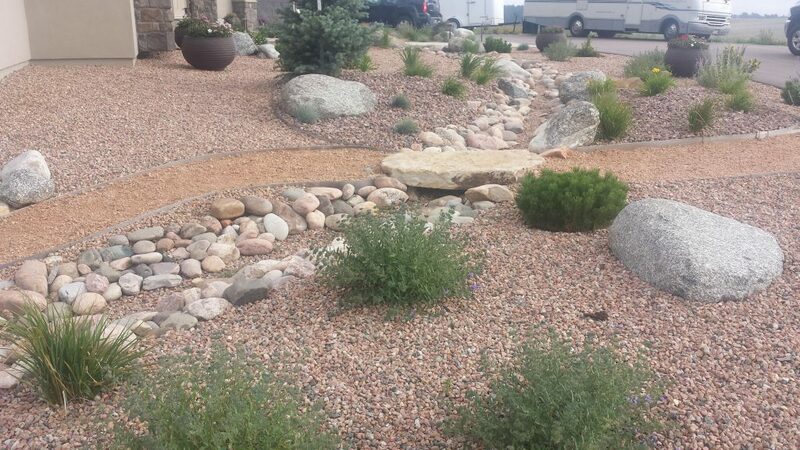 Conservation of water is the main component when thinking about xeriscaping. Grass uses so much water. In order to keep a lawn green, you have to water it in the morning and evening for twenty minutes. Sometimes you have to move the sprinkler around. It’s a lot of work and a lot of hassle. You may not even end up with green grass, it could be patchy and brown or you could get crab grass. With all that work you also end up with a large water bill. Xeriscaping reduces all that headache. How? Xeriscaping reduces grass. The biggest impact xeriscaping makes is by eliminating irrigated grass. Whether you are designing a new yard or renovating an existing yard to install grass only in the area that can be useable… meaning a place for the kids to kick the ball around or a small area for your pets. This means a smaller area to worry about watering. No more moving a sprinkler. No more patchy grass. No more giant water bill. Xeriscaping doesn’t eliminate all your watering needs. Some plants will need water, but it will be less water. A great way to conserve water is to harvesting rain water. This can be done by using a barrel or other water harvesting containers. Then use the water stored in there from the rain to water your plants instead of the water from the hose. Besides the area of grass that is being used for your pets or children, the remainder of the yard create interest with native plants and trees. These plants are used to the dry, hot, Colorado climate. They can survive in drought conditions. Some of these beautiful plants are potentillas, Russian sage, ornamental grasses, spirea, and butterfly bushes to name a few. Trees are also a great option for xeriscaping. Some great xeriscape trees are the piñon pine, Hawthorne, or ponderosa pine. Having these natural plants in your yard will not only reduce your water bill, but you will begin to recognize them out in nature. Having a piece of Colorado wildlife will build a sense of connection to the rest of nature around you. Some plants may even attract wildlife like butterflies, bees, and birds. If you’re ready to take the leap into Xeriscaping, we can help you. We will design a beautiful yard that will fit your needs and reduce your water usage. Our experts are well versed in all things xeriscape and what plants and features will create an amazing outdoor living space for you and your family. Contact us today to start your journey to xeriscaping.